"The idea behind the project was to show that porcelain is connected to some of the most emotional moments of our lives. It was natural for us to think of film, the eighth liberal art, because it's an inexhaustible source of cultural, sociological..."
sociological and artistic images. We created a video patchwork of scenes from cult cinematographic works in which porcelain played the starring role. Hijacked from their initial context to create an original work, the film sequences seem to engage in a back-and-forth with each other. The film helps its viewers realize how important these everyday objects are, and we're happy to have helped them see the light!" In 2009, Benjamin Duval and Jean-Pierre Gavini decided to team up and start a company called LES FILS DE. Although they both create visual works, they differed in their artistic training: one graduated from the Ecole des Beaux Arts and the other from the ESRA film school. When they first met, they hit it off personally and realized that their backgrounds were complementary at a time of major change in the film production business. Today, they make ad films following a new modus operandi for a clientele that is increasingly interested in the Internet and digital tools. Benjamin Duval and Jean-Pierre Gavini live and work in Paris. MUSIC Makes me wonder by Concorde. 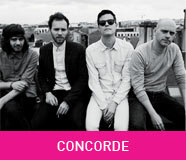 The members of the Concorde band - Clement, Max, Roger and Louis - are French and live in Paris. Makes me Wonder is a track off the album Summer House, released in 2011. With a style that defies classification, the band is determined to do its own thing, irrespective of mainstream trends. Its members spontaneously create melodies and rhythms to fit their mood, delivering pop music that is raw yet elegant, inspired by their love of vintage sound and organic electro.